In the end, like you always said, it’s just the two of you together. You have ten seconds, but there’s so much you want to do: kiss her, hold her, take her hand, tell her. The bolded words indicate clickable links; these links indicate choices; these choices lead to new passages of prose, which in turn lead to new choices. These choices may form a seemingly endless chain of new narrative branches–leaving you clicking to the end, perhaps reaching the countdown before your eyes can even finish reading your current sentence–or they might land you in a moment of stillness and quiet. But “there’s so much you want to do” and you know can’t possibly do all of it, beginning with those first four verbs, leading to different prose branches. Who are you? Who is she? The thin glimpses the player is granted of this world (your world? our world? every world?) on the brink of annihilation and the briskness of the ten seconds that begin their fateful countdown the moment all but demand the player fill in the blanks, the details. Perhaps there’s a “she” you see every day, who, “just like you always said,” you’ve sworn you’ll be with at the end. Perhaps you miss some such “she.” Perhaps she is fantasy. Perhaps your “she” isn’t a “she” at all in your mind. When the timer’s ten seconds expire, you are transported away from whatever you’re lookin at to a screen with a simple, final sentence: “Everything is wiped away.” The game has ended and time has with it. What you were reading, whether passionate love-making or a consuming and quiet embrace, has vanished. The frenzy or anticipation you experienced as the clock dwindled has led you here, and a silent game has somehow become more silent. Restarting the game allows you to dive right back in, to experiment with alternate choices or to click quickly through your last path to get just a bit further. Lo and other writers have focused their readings of the game on exploratory repetition, learning the outlines of the branches you didn’t take before through repeated play, in ways not altogether unlike how a speedrunner might explore every possible action to determine an optimal run or a completionist might achieve 100% on an RPG using New Game-Plus functionality, though this analogy is troubled by the fact that the game has no win states and a single, unavoidable ending. Restarting is a game-endorsed invitation, of course, as witnessed in the game’s immediate prompt once the world has ended, no matter how many times you play. This potential for endless repetition and the clear availability of every branch are central to Lo’s reading of the game as” grounded in feeling and emotional relations as opposed to linearly temporal, corporeal, or physical relations” (191), a queer exploration of temporality. I like this reading. I’m interested, too, in what it means to take these ten seconds that constitute a single playthrough as the end of the world indeed, to play through the game once and walk away, at least for a time. If you come back to the game after you’ve forgotten the contours of prior playthroughs, I find, the world’s end potently retains its urgency and its crushing finality. This leads me to the other option once everything is wiped away and something Lo makes no mention of: the afterword. While the game’s text has thus far all been dynamically rendered by your browser application in a tasteful, regular sans serif font, now your screen is occupied by the messy, almost tactile scrawl of graffiti, it’s letters partially dripping down the screen: “when we have each other we have everything.” The materiality of this image of words is a stark contrast to everything before the afterword, a screen ungoverned by the game’s possible looping, doomed time. Critically, the afterword doesn’t use “you” or “she,” but it does use “we.” Further, the game’s present tense narrative voice gives way to a conditional statement that seems unbound by time. Together, these serve to interrupt and recast the play experience and draw the player into a different dimension. Below this, again in our webpage font, we see an option to restart but also the note that this was “Inspired by an image I found on tumblr,” with a link to an image that apparently was very directly adapted for the afterword, a photograph of a casual photo of bathroom door with the same text painted on it in black, even with the same drips. With the click of that link, you’re transported away from any “restart button,” closing the potentially unlimited recursive loop from the game. Both of these links provide exits away from the world we’ve seen end. One returns us to it endlessly, to inhabit the open possibilities of the scenario. One brings us back to dingy reality, juxtaposed with a sweeping statement of expansive love. Is Queers in Love at the End of the World a rehearsal for the coming end of the world? Is it a prism? A laboratory for imagining lovers real and imaginary? A fantasy of escaping death through its embrace, so long as you have one to embrace? I suppose the answer to all the above is, well, yes. Queers in Love at the End of the World is wonderful. Queers in Love at the End of the World is playable in-browser at itch.io. Cat Sokoban (not made in PuzzleScript) does not feature the most complicated or sophisticated puzzle design you’ll ever encounter in a sokoban game. However, instead of pushing around boxes or balls, you find yourself, quite literally, herding cats. Living, curious, wandering cats. There’s a good chance that that information alone is enough to make you want to go play it, so feel free to skip the rest of this review and herd some cats right meow. Author sylvie’s characteristically adorable pixel art really makes the game come to life. 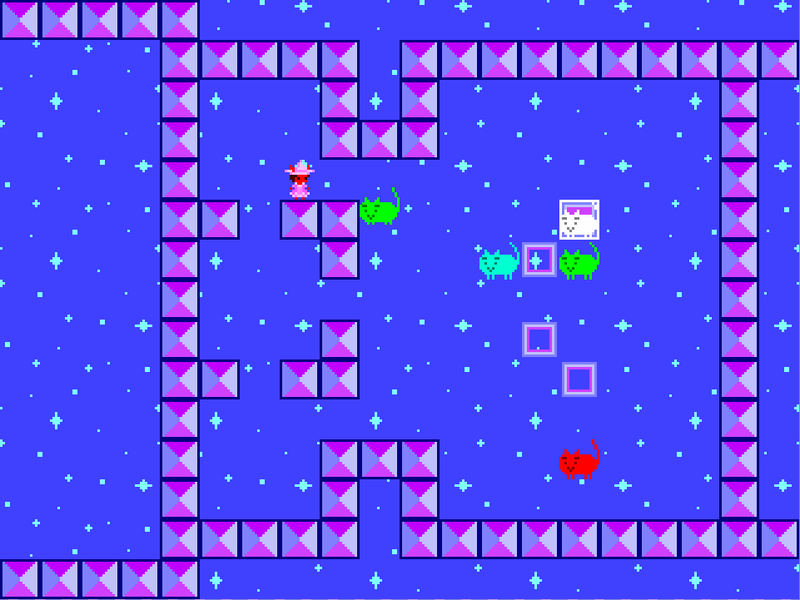 You also get a randomized assortment of cat colors with each stage try. And cats–as cats are wont to do–will fall asleep. If they fall asleep at their destination, this is good news for the harried cat-herder. However, if they fall asleep anywhere else, it becomes impossible to move them while they doze and their nap time makes it that much less likely that cats you’ve secured in place will remain there. The fact that these cats have minds of their own means that sylvie can set up situations that would be impossible in normal sokoban games. These cats can be frustrating, to be sure, but if their cute little mews fail to melt your heart, their precious little faces while they sleep just might. Who can stay mad at that? Cat Sokoban is available to play for free on the author’s website. *Of note is that 2013 is also the year that Increpare released one of the highlights of the entire genre, English Country Tune.